SpaceX head Elon Musk has unveiled the latest version of his Dragon spacecraft via a highly anticipated event at the SpaceX factory in California. Known as Dragon V2, the spacecraft is the crewed version of the ship that recently returned from its fourth trip to the International Space Station (ISS). This latest Dragon is the current favorite to win the right to return domestic crew launch independence to the United States. The United States lost its ability to launch its own astronauts when Atlantis concluded her – and the Shuttle fleet’s – last mission in 2011. With the Agency undergoing a major transition towards returning to Beyond Earth Orbit (BEO) exploration, the interim solution for launching NASA astronauts to the ISS was to pay Roscosmos large amounts of money for spare seats on the Russian Soyuz, thus allowing a continued US presence on the orbital laboratory. While the political risk of outsourcing astronaut transportation to the Russians has since become more evident, lawmakers have done little to prioritize the drive to ensuring a new fleet of American vehicles would be ready to take up the role as soon as possible. The reality was a reduction in what was already a small part of NASA’s budget being spent on the Commercial Crew Program (CCP), resulting in what is now a gap that ranges as far as the end of 2017 before the debut launch of NASA astronauts on a commercial vehicle – a mission known as USCV-1 (US Crew Vehicle -1). The irony of underspending on Commercial Crew has resulted in hundreds of millions of additional US tax dollars being sent to Russia for additional seats on the Soyuz. 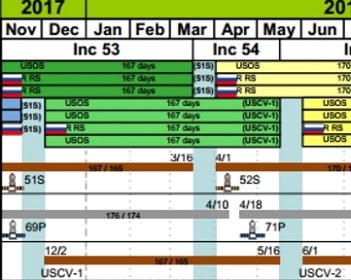 More money is expected to be handed over in the coming years, given Soyuz remains on the manifest even after the USCV-1 date, providing a near-back up role for the commercial vehicle. The three main contenders for the eventual contract from NASA to launch their astronauts to the ISS are all making good progress. Boeing’s CST-100 spacecraft recently showed off the interior that astronauts would look forward to ingressing ahead of rides to the Station. 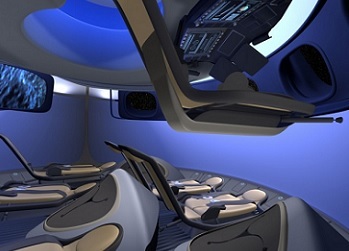 The photos published by Boeing show a sci-fi/first class airliner interior that is a far cry from the even the much-loved Space Shuttle orbiters that CST-100 manager Chris Ferguson had the honor of riding inside. Boeing has also been busy working the paperwork, with another milestone on the evaluation of the spacecraft’s software recently conducted via a CDR. SNC have a real contender, with their Dream Chaser spacecraft removed from the commonality with the two capsule spacecraft she is in competition, which provides NASA managers with an interesting set of attractive alternatives to consider, including cross-range, multiple landing options. Dream Chaser recently passed Milestone 8 in her CCiCAP checklist, the Wind Tunnel testing involves analyzing the forces and flight dynamic characteristics that the vehicle will experience during orbital ascent and re-entry, as the Dream Chaser Atlas V integrated launch system. The plan, according to SNC, is to fly an internally selected crew of astronauts on that vehicle at the end of 2016 – which has since been noted in the FPIP ISS manifests in L2 – with a potential USCV-1 flight – should SNC win the Commercial Crew contract – at the end of 2017. SpaceX’s Dragon recently completed its fourth mission to the orbital outpost, successfully concluding the CRS-3/SpX-3 mission with a safe splashdown in the Pacific Ocean. 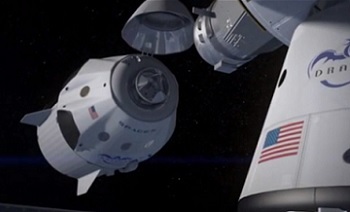 SpaceX was already planning to reveal the crewed Dragon, sometimes referenced as the DragonRider, or Dragon 2, but now officially tagged as Dragon V2. On Thursday they finally pulled the wraps off the next version of their spacecraft. After first showing one of the flown Dragons, Mr. Musk pulled down the curtains to reveal the Dragon V2. 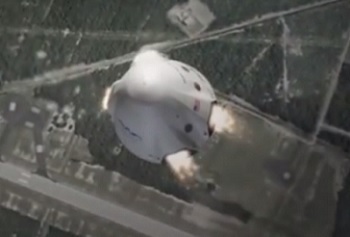 Immediate references were made to the propulsive landing technology that will be employed by the new Dragon, a key part of SpaceX’s ongoing full reusability aspirations. 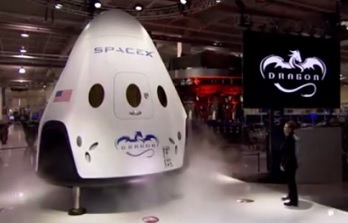 SpaceX plan to test their propulsive landing of their Dragon spacecraft via the test vehicle known as DragonFly. While the capsule was on show at the SpaceX factory, an animation showed the full spacecraft in flight, along with its trunk – now sporting the solar arrays around its shell. The trunk also has fins, as had been rumored since last year (L2) – although the reason for the fins inclusion were not explained at the reveal event. While there is a small throwback to NASA’s MLAS fins, it is likely the Dragon V2’s fins are installed for aerodynamic reasons, as opposed to the role of radiators – as was initially thought. The animation showed the Dragon V2 arriving at the ISS, with its nose cone opening to reveal the docking system, which is a common docking system on the Station that is compatible with numerous spacecraft. Unlike current Dragons, the new spacecraft won’t be grappled and berthed by the Space Station Remote Manipulator System (SSRMS). Following undocking, the Dragon V2 is shown placing the nose cone back over the front of the spacecraft before separating from the trunk section. Racing through re-entry, protected by what Mr. Musk noted will be the third generation of their PICA-X heat shield, the spacecraft is shown turning on its set of SuperDraco thrusters, slowing it down for a guided touchdown at a designated landing site. “That is how a 21st Century spaceship should land,” he noted, accompanied by whooping from SpaceX workers in attendance. The aspirations of propulsive landing does hold some risk, such as a failure of the thrusters. 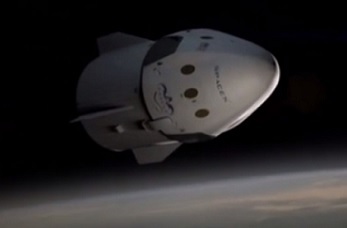 However, SpaceX have that covered via the redundancy of the parachute system that will still ride with the Dragon V2. “Although it wasn’t shown in the video, Dragon V2 still retains the parachutes of Dragon V1,” Mr. Musk explained. “When Dragon reaches a particular altitude, a few miles before landing, it will test and verify all the engines are working and then proceed to a propulsive landing. Notably, the Dragon V2 can still land propulsively, even if two of the thruster engines fail. The SuperDracos are built in pairs, in separate cells, allowing for one or the other to take up the load, should then be a problem in one engine cell. Mr. Musk then showed off the interior of the Dragon V2, complete with its luxury seats and impressive control panel that was pulled down over the pilot’s seat. 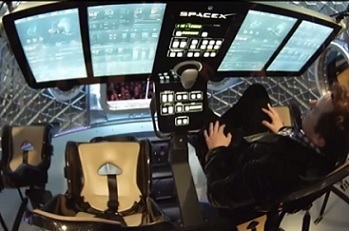 The SpaceX chief showed an overlay panel with what appears to be simplified controls, as would be expected on a modern spaceship. “We’ve aimed for something – with the interfaces and overall aesthetic – that is very clean, very simple. As the pilot, you’re able to interact with the screens overhead and control the spacecraft,” he noted. The spacecraft will have seats for seven astronauts and appears to be surprisingly roomy inside – although Mr. Musk did struggle to egress the ship. “It’ll be much easier in zero G,” he joked. As to when the Dragon V2 will be in such an environment, all of the Commercial Crew contenders are aiming to launch an internally selected crew on a test flight in 2016. 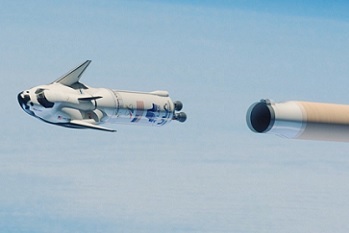 Dragon V2 is likely to be in a position to conduct such a test mission as early as 2015, should political will result in sufficient funding to enable such an acceleration. (Images via SpaceX, Boeing, SNC, NASA and L2).